This week, Korra finally gets involved in Book Four’s Kuvira plot, and the series experiences a considerable upswing in quality as a result. While “Enemy At The Gates” doesn’t deliver the metalbending military action extravaganza I was hoping for (we’ll have to wait until next week for that), it does great work fleshing out character motivations and putting pieces in place for a high-stakes showdown between Suyin and Kuvira, with Korra caught in the middle. One of the most admirable things about this show’s handling of the Su/Kuvira situation is that it’s not a simple case of hero versus villain. In the present, Kuvira has definitely gone over to the dark side as she builds her Earth Empire by force and puts dissenters in prison reeducation camps, but as we see in this week’s flashback, she had noble intentions when she began her campaign. Three years ago, Kuvira wasn’t the hardened military commander she is now. She was a soldier that saw her superior turning away from an important responsibility, and she chose to step up in hopes that she could incite some positive change in a kingdom that had descended into chaos. You can hear the change in Kuvira’s character in Zelda Williams’ voice work, which is noticeably less pointed in the flashback. Hearing a softer Kuvira helps sell the idea that she’s legitimately focused on healing the Earth Kingdom instead of gaining power for herself, but once she makes the decision to leave Zaofu, the aggression of present-day Kuvira starts to enter Williams’ voice. Su has been a mother figure to Kuvira since she took her in at 8 years old, and if Kuvira is going to defy the wishes of her adopted parent, she needs to show that she’s serious about her decision. She has to stop acting like a soldier and start acting like a leader—something that already comes naturally to her according to Su—and that immediate shift in her behavior is evident in Williams’ voice. As the leader of the closest thing the Earth Kingdom has to a utopian society, Suyin Beifong is a natural choice to lead the stabilization and reunification campaign, which is why it’s remarkable that she’s so actively opposed to the idea. Su has no interest in imposing her values on an entire nation, understanding that the reason Zaofu has thrived is because it’s been a small, contained city-state. It’s an environment that Su can monitor very closely, and when there are problems, she can deal with them in a diplomatic way that maintains the peace she’s worked so hard to establish. Charging into Ba Sing Se goes against Su’s principles, and she doesn’t want to be perceived as a conqueror and start even more conflict. Kuvira has quelled rebellion by showing force, but that’s not how Su operates, and she’s not going to make herself that kind of leader to satisfy President Raiko and Tenzin. If Su had decided to step up and rebuild the Earth Kingdom, it’s possible that the world wouldn’t find itself in its current situation, but at what cost to Su? Unlike Kuvira, she’s a mother and a wife and the leader of her own city-state; she has a lot to lose by becoming the savior of the Earth Kingdom, and she’d rather not risk it. But Su isn’t perfect. She’s vulnerable to her emotions, and when Kuvira threatens Zaofu, Su decides to stop her rival by infiltrating Kuvira’s camp with her sons Wing and Wei. These actions all but guarantee an attack on Su’s home, setting up what will hopefully be a massive face-off next week. Korra is back this week, but she doesn’t do much. When Su asks her to go into the Avatar state and destroy Kuvira’s army, Korra refuses because she’s learned that fighting rarely solves much of anything. The old Korra would have charged into battle, but she’s been changed after three years and doesn’t want to make the same mistakes as before. What she doesn’t understand is that the rest of the world has changed too, and Kuvira isn’t the same woman that saved Tonraq’s life during the battle at the Northern Air Temple. This new Kuvira is drunk on power and won’t stop until she has her fill, and no matter what Korra says, words aren’t going to stop her. As “Enemy At The Gates” delves deeper into Kuvira and Su’s relationship, it also shines a light on the series’ supporting cast, devoting attention to Bolin, Varrick, and Zhu Li as they realize how unhinged Kuvira has become, and giving Asami her own subplot in Republic City. Varrick is the highlight of this week’s episode, largely because John Michael Higgins is such a fantastic voice actor. Like P.J. Byrne as Bolin, Higgins is totally committed to his dialogue, which makes the humor of the script hit with even more force. And as the situation becomes bleaker, that humor becomes more and more important to the series. After treaty talks with Su fail, Kuvira plans to take Zaofu by force, a decision that doesn’t sit right with Bolin, who has been looking at his leader through an idealized lens up to this point. When he disagrees with her, she threatens to throw him in a reeducation camp, finally convincing Bolin that he’s been working for the wrong side. Meanwhile, Varrick comes to a similar realization while working on his spirit vine project; as he attempts to extract the massive amounts of energy contained within the mystical greenery, he realizes that the reason his experiments keep going wrong is because this kind of power isn’t supposed to be in the hands of mankind. Varrick is having a crisis of conscience, which is particularly extraordinary because it means that Varrick has a conscience in the first place. (He’s just as surprised as everyone else.) There’s a little voice inside his head telling him that what he’s doing is wrong and it’s going to hurt people, and it’s forcing him to behave in strange new ways. 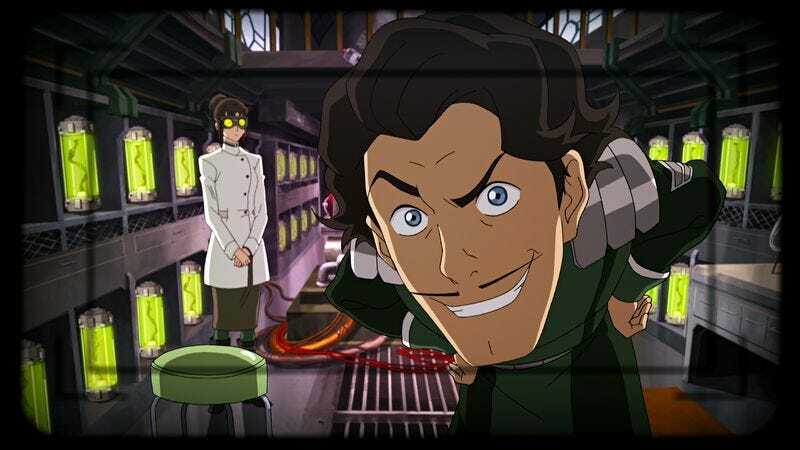 When Bolin appears in Varrick and Zhu Li’s lab to warn them about Kuvira, the three decide to run off in mechsuits, and rather than sticking around to save a “doomed” Zaofu, Varrick wants to head to Republic City and warn the rest of the world of the power of Kuvira’s spirit vine weapon. The spirit vine is a nice little metaphor for atomic power, continuing this show’s progress through major real-world developments of the 20th century, and I have the feeling Kuvira will master this technology by the end of the season, making her an even bigger threat to global Balance. The Bolin/Varrick/Zhu Li plot builds to this season’s first great action sequence, pitting the trio of turncoats against Batar and two of Kuvira’s soldiers in an excellent mechsuit battle. It’s a rare opportunity to Zhu Li to show off her badass side (Varrick is largely useless for the entire sequence, except as comic relief), and Bolin proves why he’s a world famous action hero once his mech is destroyed and he’s forced to fight without any armor. It’s pretty damn awesome seeing Bolin rip a giant tree out of the ground and throw it at Batar, but the coolest moment of the battle is when Bolin catapults himself into the air and bends a giant wave of lava upon landing, eliminating two of his three opponents. After being absent for the last three episodes, Asami returns to the series with a subplot exploring her unresolved issues with her imprisoned father. While it’s nice to see Asami back and getting a storyline of her own, it does feel like her plot is tacked on to this episode. All of her scenes move very quickly, and as the tension increases with the Zaofu story, those jumps to Asami become speed bumps in the episode’s momentum. But it still provides some nice emotional moments between father and daughter, especially that last scene when Asami asks her father to play pai sho with her like they used to, the first step in healing a broken relationship. While Su and Kuvira are pushed further and further apart, Asami and Hiroshi’s reconciliation offers some hope for the future of the relationship between the two women. Granted, things between the Satos never escalated to the level of the conflict between Su and Kuvira, and it’s hard to see them coming together after the events of the last three years. Based on this week’s cliffhanger, the feud between Su and Kuvira is about to boil over big time, and devoting extra time to their relationship this week adds emotional depth to their inevitable physical showdown. Will Korra step in and set things right before that happens? At this point, it’s not looking very likely. I really like the staging for the scene when Kuvira and Batar come to Suyin and her family to discuss Zaofu joining the Earth Empire. The two opposing forces are on different sides of the room, with Bolin in the middle trying to negotiate terms and a model of Zaofu serving as a constant reminder of what’s at stake in this conversation. It must be especially painful for Hiroshi to see his daughter now that she’s starting to look more and more like her mother. He’s faced with not only the disappointment of his daughter, but also that of his dead wife. Wing and Wei are not down for Bolin’s high five. “What?! No fight?! Why did we go through all that trouble to save you if you’re not going to beat someone up?” Meelo’s facial expressions during this line are exceptional. 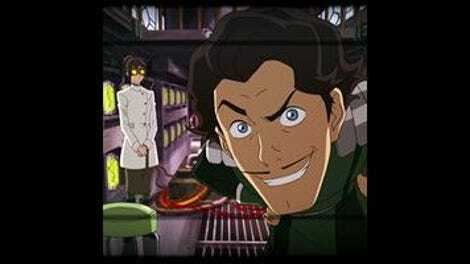 I’m still waiting for Meelo and Varrick to battle it out for exaggerated facial expression dominance.